I’m not sure where the idea originally came from, but sometime towards the end of November last year I decided to take inspiration from my childhood advent calendar and make a digital one. The goal was to offer a daily prompt or short essay themed around the topics of Making, Doing and Being. 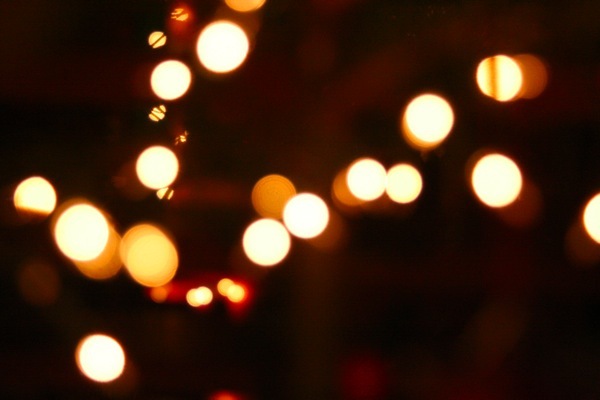 The challenge was to create a little space for slowing down, consuming less, and being more present during the holiday season. Swedish Christmas always involves advent calendars, whether they are in paper form or something larger. The tradition of printed advent calendars dates back to the early 1900s in Germany. Growing up, I had a particularly special advent calendar, one that my mother had woven, filled with 24 pockets, each to hold a small note. It hung outside my bedroom door and every night, she or my father would write a note for the following day and slide it in. When I woke up, it was the first thing that I checked. Sometimes the notes would be about a holiday task to do that day, like baking cookies or decorating the tree. Other times it was just a prompt for taking a little extra time to make an ordinary activity a bit more magic, like listening to music or reading a book. It made all of December – not just Christmas – special. This can be a difficult time of year for many reasons. Family relations can be strained, social expectations can be crippling, stress levels run high and money might be tight. At the same time, there is also so much potential for magic and wonder. But we have to actively create it, and we have to show up for it. December means the arrival of the solstice, and in the Northern Hemisphere, winter begins. Perhaps just like we’ve lost the meaning of the holidays—trading experiences and togetherness for mass consumption—we’ve also lost the winter way of being. We have forgotten how to slow down, how to hibernate. Instead we sprint as fast as we can to the “big day” and then count down the days to the New Year when we can give ourselves the gift of a blank slate. Think of all the advertising and marketing that happens at this time of year; so much of it is focused on selling a cozy, slow image. Why? Because that’s exactly what we’re craving. Here’s the secret to that kind of living: you can’t buy your way to that feeling, you have to create it yourself. The goal with this advent calendar is to do just that; create a little magic every day during the month of December, so that’s it’s not just a countdown but an everyday celebration. It’s a focus on slowing down, finding balance and contentedness. The calendar is created as an antidote to the consumer frenzy that has come to define this month, a challenge to ground yourself wherever you are and reconnect with both yourself and the people around you. Of course, the joke in my family all of last December was that while I was busy writing about slowing down, I was cranking out the newsletter on a daily basis, often in quick bursts between other projects. There were nights when I was up late because I realized I had forgotten to schedule the next day’s post (my parents tell a similar tale of all those years spent writing notes for my advent calendar), and there were even a few “morning of” emails, all crafted while wondering why I had committed to this thing in the first place. But inevitably in those moments of insecurity, of wondering if perhaps I could have chosen a better use of my time, someone would send me an email to thank me for bringing a little light into their day, and I would feel a sense of immense gratitude. The whole endeavor ended up being one my favorite things that I did last December. It turned out that I needed it as much as everyone else did. So much so that I decided to do it again. If you want to receive the Making, Doing and Being digital advent calendar, all you have to do is sign up for my newsletter. Every day, you’ll receive a morning email. It might include a recipe, a quote, a prompt. Whatever it is, it’s always paired with an original papercut illustration. There will be some Scandinavian inspiration as well, and this year, even some input from friends and colleagues who I think embody this concept of Making, Doing and Being in their own personal and professional practices. There’s no paywall and you’re not required to buy any of my books or work to receive the digital advent calendar; it’s 100% free. I want to keep it that way, accessible for everyone, because I want to share without expectation, create art and magic and put it out into the world just because. In a world gone mad, that feels like the one sane act that I can contribute. That being said, putting together this work takes time and effort, so if you feel like making a donation to sponsor the advent calendar you can do so here. It all kicks off on Saturday December 1, 2018, so if you want to receive the advent calendar, be sure to sign up for my newsletter. Growing up, we always made a recipe out of the classic Swedish baking book Sju sorters kakor, called Franska pepparkakor, French gingersnaps, for Christmas. Why they were French I am not entirely sure. I have lived in France and never encountered anything similar. A more apt name is skurna pepparkor, sliced gingersnaps. I like making these because they take much less time than rolling out and cutting traditional pepparkakor but still use the same iconic seasonal spices. This year, I adapted the recipe to be a little less sweet and also be made with 100% rye flour. I like making whole grain cookies, because they are far more robust in flavor than baking with traditional all-purpose flour. These cookies are great on their own, but also pair very well with a little blue cheese. And a mug of glögg of course. Chop the almonds and set them aside. Cream the butter, sugar and molasses, then mix in the spices and orange zest until well blended. Mix the baking soda with the flour, then add to the wet ingredients. Work the dough together (it will be quite sticky). Grease a baking tray and cut dough into thin slices. Place the slices on the tray and bake at 375ºF (180ºC) for 10 to 12 minutes.The cookies don’t spread out very much, so you can put them pretty close to each other. 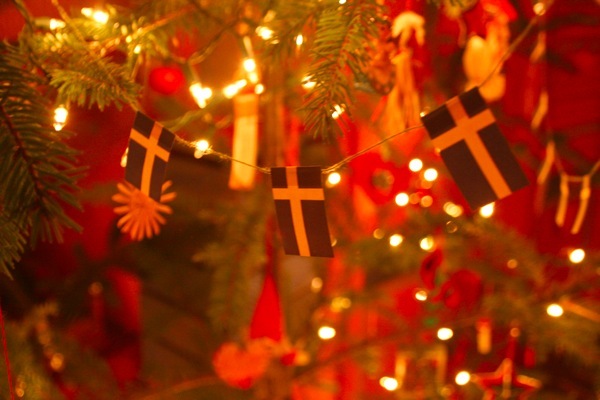 December 13th marks the celebration of Lucia Day, an essential tradition on the Swedish holiday calendar. This is where all of the photos of children dressed in long white dresses with red sashes and wreaths in their hair come from. Ultimately, it’s a celebration of light – which is no surprise given the dark, Swedish winter – and whoever is crowned Lucia wears a wreath of candles in her hair. 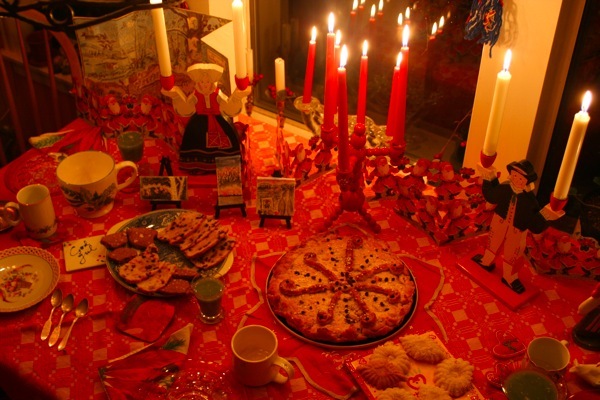 The traditional treat served on Lucia Day is saffron buns. Bright yellow from the spice, these sweet, yeasted buns are formed into a variety of shapes (some of which are pictured in this vintage illustration) and served with a cup of coffee or mug of glögg. Swedish Saffron Buns – This is the classic recipe, complete with a few more illustrations of different forms that you can make. Saffron Cake with Hazelnut and Whiskey Filling – I always like making a cake out of the saffron bun dough, and filling it with almond paste. This year I did something a little different and made the filling out of hazelnuts. With a dash of whiskey for good holiday cheer! Saffron Bun Cookies – A gluten-free recipe, inspired by the traditional saffron buns. The cookies are made with rice flour and ground almonds, then twisted into the classic saffron bun shapes. Sweden has snow and weather in the negative teens. Here in the Northwest it’s dark and rainy. The perfect time for candles, mandelmusslor, saffransbröd and glögg.